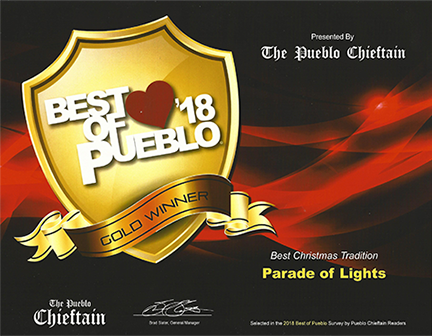 will begin Saturday, November 30, 2019 at 5:30 p.m.
Best of Pueblo awarded for the 2017 Pueblo Parade of Lights. for ​Pueblo & Southern Colorado! west to disband at 6th and Court. The high winds and rain forecast for the 2018 Pueblo Parade of Lights turned out to be much lighter than expected. Although we were unable to start with fireworks, the parade was great. Many spectators and a few floats or other entries stayed home, not wanting to brave the wind, but it was their loss. We had some of the best floats ever! If you were unable to make it downtown, be sure to watch the rebroadcast of the parade on Channel 19 or see still photos on the "Photos, Winners, etc." tab of this website. Thanks to these businesses for supporting this year's parade! ...A group of us build the float and we have a group of mechanics that tackle the truck. It takes us 7 days to do what you see. ​​anything Pueblo Parade of Lights! ​We'd love it if you would share your photos with us. ​​Send your photos to PuebloParadeofLights@gmail.com. Put "parade photos" in your subject line. Include your name and address & we'll send ​you a token of our appreciation. and took some beautiful photos. Thank you, Rita! ​We hope you visit again.